John Neff - Famous contrarian investor known as the "professional's professional" because many fund managers entrusted their money to him. 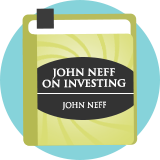 Here follow a selection of stock screening strategies that we have modelled based on the writings of or about John Neff. These strategies are not endorsed by the author.